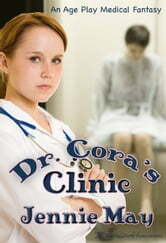 Dr. Cora has a special relationship with grown-up little boys and girls. She has opened a medical clinic where age play Mommies and Daddies can take their Littles for check-ups, vaccinations and to be treated for illnesses. Dr. Cora and her two nurses are compassionate care givers, but they are also strict. They only give shots and take temperatures in the bottom, and they don't hesitate when a spanking is needed. Dr. Cora is fulfilled by her practice, but there is a void in her life. Can Dr. Cora continue with her career and find her own special relationship at the same time?